Uglyworld #581 - I'm So Glad I Borrowed Cinko's Jacket, originally uploaded by www.bazpics.com. The cool thing about most of the large waterfalls which reside inside Silver Falls state park is that you can walk behind the waterfall and experience it's raw energy up close and personal. 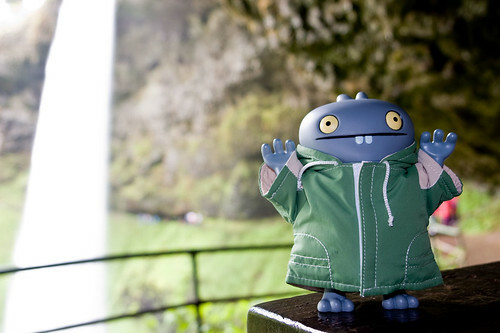 By the time Babo had walked round behind he was soaking wet but after a quick shake off he was ready to pose for his obligatory picture in which he said, "I is going to shows everyone the size of the waterfall with my hands". So there you have it, it's BIG!